These steamy, saucy mussels with chorizo sausage in a rich tomato-wine broth are divine. Even better when you have a hunk of crusty bread to mop up the juices! Flouncing around in frilly skirts, nibbling on fresh fish, cheeses and olive oil-soaked bread, and admiring the amazing architecture… ahhh. These are just a few of the things I can’t wait to do in Barcelona this week! Besides, of course, devouring a dish of scrumptious, saucy mussels and watching the sunset sizzle over the city. By the time you read this, we’ll be well on our way, excited yet exhausted from our long day of traveling! There’s lot to look forward to, and the food will for sure be my personal highlight. But, I’m hoping to collect lots of good memories and snap plenty of pictures while we’re gone. You can follow The Comfort of Cooking on Facebook, where I’ll be posting plenty! Before our blissful time in Barcelona, though, I wanted to cook up one of my favorite Spanish dishes to celebrate – mussels and chorizo sausage in a spicy, saucy tomato broth with white wine and fresh parsley. Doesn’t that just sound so mouthwatering and Mediterranean chic? You can practically taste it just by saying it out loud! With a loaf of fluffy French bread and a glass of wine, the flavorful mussels and spicy chorizo go down so smooth. If you’ve never had mussels, I think you’ll be delighted. They’re not fishy or slimy, but fluffy and tender, with a slight taste of the sea. Also, try smoked turkey sausage in place of the chorizo if you like – it works just as well! Get your hands on smoked paprika, too. The flavor is much more intense and musky than regular paprika. In a large sauté pan, cook the sausage until brown over medium-high heat, about 6 minutes. Remove with a slotted spoon and drain on paper towels. Scrape up any large brown bits and discard. Drain off all but 1 tablespoon of fat from the pan. Add butter and when melted, add chopped onion, paprika, red pepper flakes and freshly ground black pepper. Cook, stirring, until onions are tender, about 4 minutes. Add the garlic and tomatoes, and cook, stirring, for 2 minutes. Add the wine, heavy cream and parsley. Stir in sausage. Add mussels and bring to a boil. Lower heat and cover, cooking until the mussel shells have opened, about 6-8 minutes. With a ladle, serve mussels with sausage and sauce into bowls. Discard any shells that have not opened. I’ve never had mussels but these sound delicious – love the tomato-wine sauce. Have a great vacation, Georgia! Have an absolutely amazing trip! I’ve never been to Barcelona (the shame…) and I can’t wait to hear all about it! I have heard wonderful things about Barcelona, so I am sure you will have a blast. I do not have access to fresh mussels here, but your dish does make me hungry. Well plated and delicious ingredients, wish I could have shared it with you-yum! Barcelona is the best city of the world!!! I live in Madrid now but I’m from there, I’m sure you’ll really enjoy it, don’t forget to stop at La Boquería, a great market in the heart of the city and get the juice they sell, so refreshing!!! Enjoy, I’m really jealous!!! Barcelona is beautiful and romantic and the food is never dull…enjoy. Also , love those mussels. Have a beautiful, fun and relaxing trip!! What beautiful mussels dish… Yum!! Oh Georgia, I hope you guys have a wonderful time. Spain is on the top of my list! Drink plenty of delicious wine and eat plenty of yummy tapas. Safe travels! Mussels look great too by the way. They’re actually the one seafood we have a hard time getting around here. Too much marsh mud, and not enough rocks! My husband loves muscles, he would be in heaven with this meal! Have a great trip! I’m so incredibly jealous. I went to Spain during college but I haven’t been able to make it back. And these mussels! My oh my! I’m absolutely loving all the flavors in this. Saving this recipe to try very soon. Mussels in a light creamy, spicy sauce sounds amazing! Look at you go! Going on a trip and still have time to whip up a scrumptious recipe! Good luck in your latest adventure! I don’t eat mussels, but the sauce sounds amazing….I would love try with shrimp. ENJOY Spain Georgia!! 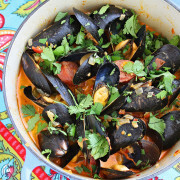 I am loving this recipe, mussels are one of my favorites. Hope you have a great time there Georgia! What a wonderful place to visit, I bet just the food alone is going to be breathtaking! I have given mussles a few tries, but for some reason they are just not my favorite thing to eat. Clams on another hand is a totally different story, wonder whether I can use the same recipe just switch out the seaood? Hi Georgia! Have an AMAZING trip. I can’t wait for us to rendezvous when you return! What a gorgeous dish! Wishing you a beautiful and safe trip! This is DEFINITELY my kind of meal. Dipping good bread in leftover soup is even better. Just thinking of it make my mouth water. I love sweets and all kinds of desserts but I think I’m definitely a savory person drooling crazy for this. Haha. Have a safe trip! I’ll be checking your facebook post! these look so beautiful and colorful! loove mussels, especially having bread to dip in the leftover goodness. What a delicious looking dish!! Barcelona! Que fabuloso! This recipe looks to die for! This sounds just amazing! And have a wonderful, fabulous vacation! I’ll be anxious to hear all about it! the pictures look fantastic! :D hope you`re having lots of fun! this looks delicious.. Spanish food was tough for me though since I don’t eat a lot of meats, but I loved their cafe con leche and ensaimada for breakfast and of course, TAPAS! :-) Have a blast! I’m so jealous! This looks divine! The sauce would be wonderful with some pasta too. I hope you’re having an awesome time in Spain! The Gaudi stuff is really neat. :) It’s really cold over here in Germany so I really hope you have much better weather over there! And France?! You’re so lucky. Mussels aren’t my thing but this dish looks very pretty! Mussels are one of my favourite treats, looks lovely! Sounds like a fab vacation. Have fun on your trip! I am going to Spain too next month and can’t wait :) This looks delicious btw, I love anything with chorizo. Wow, have an amazing time! I want to make this because I had a similar dish at a restaurant on my birthday that was out of this world! Have a great trip and congratulations on making the foodbuzz Top 9! Mussels are sooo good, and this recipe takes the cake! Gorgeous photos too. Congratulations on Top 9! I haven’t eaten mussels in a long time but I think I need to give them a try again. Your trip sounds amazing, by the way!! Appreciating the hard work you put into your website and in depth information you present. It’s good to come across a blog every once in a while that isn’t the same out of date rehashed material. Great read! I’ve bookmarked your site and I’m including your RSS feeds to my Google account.